Purchase your subscription now – Prices Go Up May 1, 2019! Since 2017 end, there has been a drop in closure activity from 33% to 27% resulting in an increase in active caseload to 6,881. With caseload up by 91%, has the LAT reached its tipping point? Prices Go Up May 1, 2019! You have reached the event limit. Click here to sign-up for an account. Stay on trend with the most current information to help your decision making. 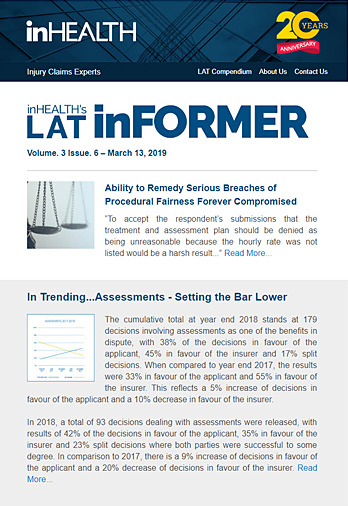 inHEALTH’s LAT inFORMER positions you for success with important information on emerging issues and trends, breaking news, and newly added decisions. Filter past LAT inFORMER newsletters (formerly known as Emerging Issues) by date. Expect to receive LAT inFORMER updates every Wednesday! 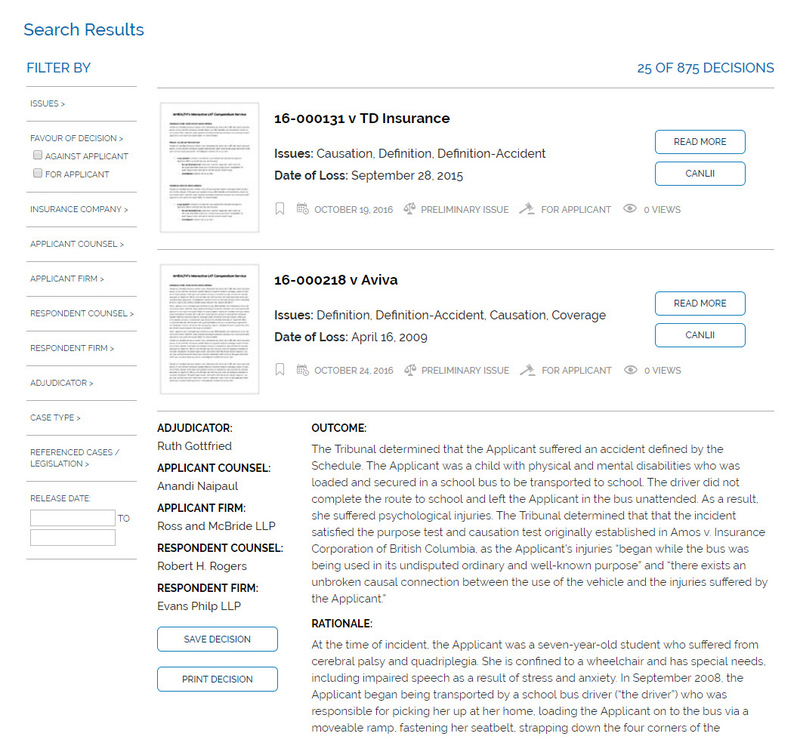 An event is counted when you click on a ”Search” or a “Read More” case summary. What is inHEALTH’s LAT Compendium Service? What is the expertise behind the case summaries? inHEALTH’s case summaries are backed by a combined 70+ years of AB/BI experience. These nuanced case summaries help the reader glean factually based and unbiased information on the outcome of disputed AB claims. 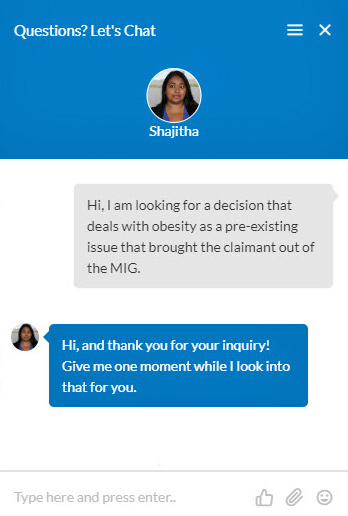 How does inHEALTH get access to LAT decisions? From our subscribers when they are released to the parties. How often will I receive information on LAT decisions from inHEALTH? What is the Archive of Updates? A filterable collection of past LAT inFORMER newsletters (formerly known as Emerging Issues) by date that are tagged by category of benefits/issues. What is the difference between inHEALTH’s LAT Compendium and CanLII? What is a Read More? “Read More” is a nuanced, neutral, and factually based case summary of the published LAT decision that is expandable from your search. What are my search options? You can purchase a subscription through our Order Page for the Bronze and Silver levels. Contact us by phone or e-mail to discuss pricing for a Gold Subscription. How is the subscription charged? inHEALTH’s LAT Compendium Service is an annual subscription fee charged upfront. How many users are allowed on each subscription? Each subscription allows unlimited users, and each user will receive their own unique login credential. How do I keep track of my events used? Through an inHEALTH issued month-end reports detailing event usage. With periodic notifications once 80% of your events are used. 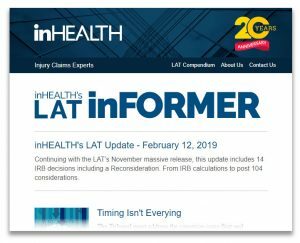 Who uses inHEALTH’s LAT Compendium Service? How do I benefit from understanding the outcome of disputed AB cases? How does inHEALTH’s LAT Compendium Service help with risk assessment?